In this Artifact Art piece, a scene of a cabin in the wintertime is depicted on an antique tea kettle. The kettle measures 8 inches in diameter and 10 inches high. 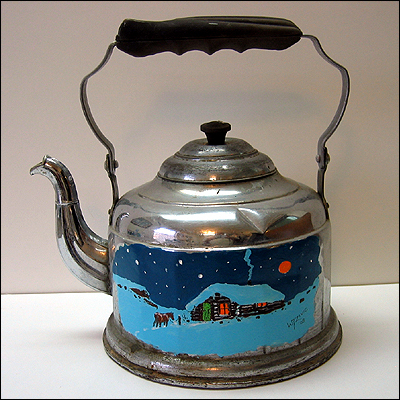 This beat up old tea kettle has seen better days, but the hand soldered seams still hold. Painting of cabin in winter where a cup of hot tea would be welcome. Nice art for a kitchen or dining room used to hold flowers.